BADHOEVEDORP – On October 10th the second National BAL Seminar was organised by Martijn van 't Veer and his colleagues from NTCB. The aim of the seminar is to share knowledge with professionals in related fields on a non-profit basis. Almost 130 attendees, mainly consisting of airfreight security experts and government representatives from the Netherlands, joined this interesting and interactive event which took place at the Ramada Hotel in Badhoevedorp. The seminar gave the opportunity to the participants to talk about trends, experiences, incidents and regulations concerning cargo- and aviation security. Robert de Bos acted as chairman of the event. To Maaike van der Windt the honor to set the ball rolling as the first speaker of the event. In her role as the Director of Aviation Marketing, Cargo and Customer Experience of Schiphol Group, she spoke about the logistics and cargo flows at- and around Schiphol Airport and the ambitions to become more market-oriented and sustainable as an organization. She also spoke about various solutions that are part of the Smart Cargo Mainport Program (SCMP) which are focused on making the supply chains more efficient. A challenge of the program is to clarify the development of Schiphol after November 2020. After this moment of knowledge-sharing, it was time for a short break. After the break, a panel debate was on the program, during which participants of the seminar were given the opportunity to ask critical questions to various specialists from within the field. Speakers Joost Rooijackers (Ministry of Security & Justice), Rogier Spoel (Evofenedex), Adan Morik (DiagNose), Sander de Man (Professional) and one of our own general managers Albert Visser (DAEL Security) participated in the panel. These panel members tried to provoke discussion during the seminar and to give an answer to all the questions asked. This often led to discussions which brought the different parties closer together. After this, it was time for a delicious lunch buffet. New this year was a Cargo knowledge quiz, which was presented by Ronald Havik (Security Officer Compliance & Training KLM) in a playful manner. The quiz ensured that the participants could spruce up topics in an interactive way. Prizes were distributed among the winners. After the knowledge quiz, attendees were given the opportunity to attend demonstrations in a more informal setting. The demo's from Evofenedex, Schiphol Amsterdam Airport, DAEL Security, DiagNose and PROFI-SEC Group were well attended. 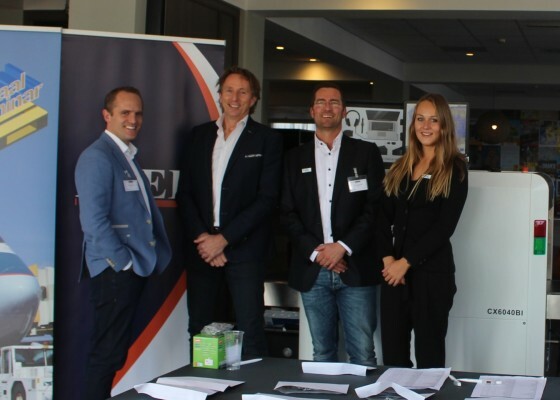 Sales managers Jan Jaap Gilhuis and Ed Nebbeling presented the Heuresis HBI120 as representatives of DAEL Security. The HBI120 is the world's smallest X-ray backscatter, and those present were given the unique opportunity to try it themselves in a self-created setting. After the demos, event manager Martijn van 't Veer closed the seminar and that’s when it was time for a networking drink at the bar! All participants also received a goodie bag at their exit. With more than 130 participants, the second National BAL Seminar can rightfully be called a success. On to the next National BAL Seminar 2019!